We reached the plain at a spot several miles to the southward of Goumou and proceeded to the Medinet Abou, which is about equidistant from the mountains and the river. The vast mass of buildings known by that name is so choked up with the ruins of more modem brick structures, that it is difficult to discover its original design. It is supposed to have composed a royal palace and two temples, the largest of which is the most magnificent to be found in the western division of Thebes. It was approached by two gateways connected by a colonnade on each side, together forming a quadrangle. Within the inner gate is the portico of the temple, on the walls of which is a series of bas-reliefs, representing battles, sieges, and triumphal processions, frightful from the barbarities which they exhibit as practised on the vanquished, but remarkable for the spirit and freedom with which they are executed. 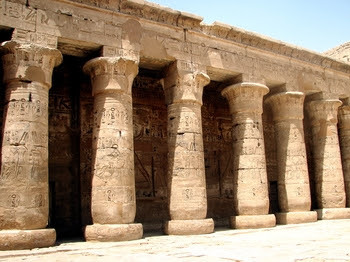 They stamp the temple of Medinet Abou as being among the most ancient Egyptian monuments, and as having been constructed while Egypt was still a warlike and conquering nation. I galloped forward to catch some features of the ruins of the temples of Medinet Abu, where the troop would take me up in passing. I arrived an hour before it. I saw that on the right of the temple which adjoins the village there was a square edifice which had been a palace, very small indeed, but to which the neighbouring porticoes would have served for additions, in a climate where galleries of columns and terraces are apartments. This litde palace has a character which differs very much from that of all other edifices, both in its plan, in its double storey of square windows, and in a sort of balconies, each of which are sustained by four heads, in the attitude of caryatides. It is to be regretted that this private edifice is in so great a state of destruction, especially in its interior, and that that which remains of its exterior decoration has been so much injured: the sculptures which decorate the exterior walls, as in that part of the temple of Kamak which I suspect to have been a palace, represent the figures of kings, threatening groups of prostrate captives. Still going before the troop, and pressed onward by its march, I hastened to the two colossuses, and saw them with the effect of the rising sun, at the hour in which it is customary to go and hear that of Memnon speak: after this, I went to the insulated palace called the memnonium. doubtlessly accompanied ceremonies like these, and which must have produced a striking-contrast with the austere asperity of these wild rocks: nevertheless, it is to be believed that this road was taken only for the sake of grander display, for the valley, from its entrance to its end, tending wholly to the south, the point at which are the tombs, can be but a very short distance from the memnonium and yet it was not till after three quarters of an hour’s march in this desert that, in the midst of the rocks, we suddenly found the openings, even with the ground. These openings at first present no other architectural ornament than a door, with plain chambranles, of a square form, decorated on the superior part with a flattened oval, on which are inscribed in hieroglyphics a scarabazus, a figure of a man having the head of a sparrow-hawk, and, out of the oval, two figures on their knees, in the attitude of adoration: as soon as the sill of the first door is passed, there are found long galleries of twelve feet in width, by twenty in height, lined with stucco, sculptured and painted; the roofs of the vaults, formed in elegant elliptic arches, are covered with hieroglyphics, disposed with so much taste, that, in spite of the uncouthness of their forms, and though there be neither middle-tint nor aerial perspective in these paintings, the ceilings present an agreeable whole, and an assortment of colours of which the effect is rich and grateful. It would require a stay of some weeks in order to seek and establish a system on the subjects of pictures so numerous, and moreover so mysterious, and I was allowed only a few minutes, and these with a bad grace. It had been sounded to horse, when I discovered some little chambers, on the walls of which were painted the representations of all sorts of arms, such as maces, coats of mail, tiger-skins, bows, arrows, quivers, pikes, darts, sabres, helmets, goads, and whips; in another, a collection of household utensils, such as cabinets, commodes, chairs, elbow-chairs, stools, and folding mattresses, of an exquisite form, and such as we have these many years admired as the productions of our cabinet-makers, when they have been guided by skilful designers: as painting only copies that which exists, we must suffer ourselves to be convinced that the Egyptians employed indian wood, sculptured and gilt, for their furniture, and brocaded silks for the coverings; to these were added various vessels, as vases, coffee-pots, a ewer, with its salver, a tea-pot, and a basket. Another chamber was devoted to agriculture, and decorated with its implements and labours; as, a plough similar to that used at present, a man sowing grain on the brink of a canal, from the banks of which the inundation has retired, a reaping, performed with the sickle, and rice-fields, in the act of being tilled. In a fourth is a figure in white clothing, playing on a harp of eleven strings; the harp sculptured with ornaments of the same tint and the same wood as those at this moment used by ourselves. How could I, thus hastily, leave these precious curiosities? I begged with earnestness for a quarter of an hour; and, watch in hand, I was allowed twenty minutes: one person lit the way, while another held a torch to each particular object to which I directed my attention. The Italian excavator Giovanni Belzoni first came to Luxor to take down the Nile the huge bust of Ramesses II, known as the ‘Young Memnon,’ which now stands in the British Museum. Dean Stanley writes of his admiration for the immense, fallen statue of the pharaoh.